On February 12,1881, George Swanton, the widower of Ellen Sweeney Swanton, living in Coppeen, married Margaret Hurley Dorne , a 28 year old widow who lived in the townland of Lissicorrane, in the parish of Kinneigh. Margaret was born in 1853, and her father was William Hurley, a farmer. George and Margaret were married in the Roman Catholic Church of the Immaculate Conception in Enniskeane, and their marriage witnesses were Daniel Coakley and William Hurley. Sometime after the birth of their first child in 1882, and before the birth of their second child in 1886, George and Margaret Hurley (Dorne) Swanton moved to Lissicorrane. In 1901, Anne Swanton was 18 and worked as a general domestic servant for the Kingston family in Enniskeane. Mary Kingston, 27, was the head of the family, and she had two daughters, Ada, 7, and Hilda, 1. Mary Kingston was a widow, and was of the Church of Ireland faith. Mary Kingston was born in 1871. Her maiden name was Mary Wood, and her father was Richard Wood of Castlelands - just north of Enniskeane. She married her first cousin and ran the Post Office in Enniskeane until her death in 1926. Her daughter Ada took it over and ran it until her death in the 1970's. There is a family story that Hilda was dropped on her head when she was a baby and never fully recovered, dying at the age of 11 in 1911 . In 1911, Annie Swanton was 27, and she worked as a domestic servant for the Nyhan family in Kinneigh. The Nyhan family was Catholic, and consisted of John, 79, a retired farmer, his wife, Anne, 78, their son John, 38, who now ran the farm, and their son, James, 46. The other family members were John’s wife, Mary, and their children, Con, 5, Denis, 4, Mary, 2, and Tom, 1 month. On June 12,1920, at the age of 36, Anne Swanton married James Murray, a laborer from Palace Anne on June 12, 1920 in the Church of the Immaculate Conception in Enniskeane. They had at least one son, Patrick Murray. Patrick Murray married Maura, and they had a son Noel and two daughters. In 1998, Patrick and Maura Murray lived in the town of Enniskeane, next door to Thomas and Maura Bradfield, who are also related to me through my Bradfield line. Patrick, Maura, and their son, Noel, help Father Sean McCarthy out at the Church of the Immaculate Conception. Mary Anne Swanton immigrated to Boston, where she married William Scanlon on November 29, 1911. They were married in the Gate of Heaven Catholic Church in South Boston, MA by Father R. J. Johnson. Their marriage witnesses were Patrick Scanlon and Julia Casey. 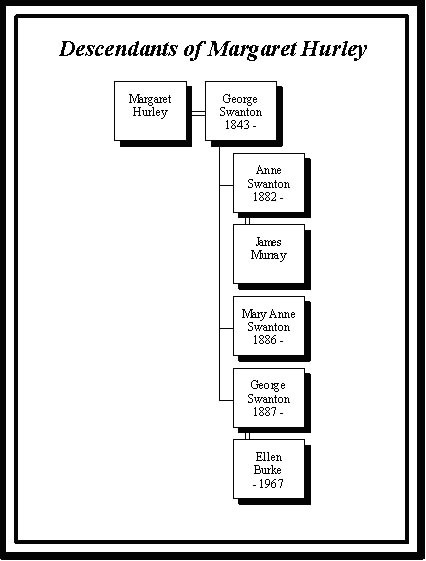 On August 9, 1922, Mary Anne Swanton Scanlon lived at 2 Lincoln Park in South Boston, Massachusetts with her half sister, Johanna (Hannah) Swanton. In 1911, George and Margaret Swanton still lived on the farm in Lissicorrane. George was 69 and Margaret was 61. Their son, George, 22, lived with them, as well as George’s granddaughter, Jane Good, who was 2.